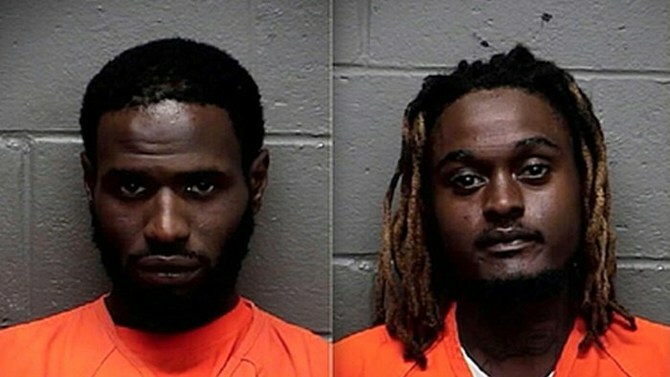 Two Atlantic City, New Jersey, criminals got a dose of karma when they appeared in court to a room full of police officers after they attempted to kill a cop during a robbery. Two officers reportedly responded to three men trying to rob three people outside of Caesars casino, which prompted a shootout. One of the suspects, 25-year-old Jerome Damon, was killed in the incident. Officer Jostle Vadell, 29, was rushed to the hospital in critical condition but was later considered stable. "Our hearts are heavy at this hour, but our resolve to captured these suspects remains undeterred," New Jersey PBA president Patrick Colligan said in a statement following the incident. "We ask for prayers for the officer, his family, and the Atlantic City Police Department." In court, suspects Demitrius Cross and Martel Chisolm walked into the court room to find a room full of police officers who showed up to honor their brother in blue. Officer Vadell's wife gave an update on her husband's condition in a Facebook post, shared by Mad World News. The heartbreaking story of Vadell's injury went viral, with many applauding the officers for showing up in court to support their colleague. "These two are a menace to society. They should never be released bk into the community. Senseless," one Mad World News reader wrote on the site's Facebook page. "Great to see that the men and women in blue are showing support for each other," another added.